The Genius Hour Manifesto was written collaboratively by Denise Krebs, Gallit Zvi, Hugh McDonald and Joy Kirr in March of 2013 at the encouragement of AJ Julliani who later published it as a chapter in his eBook, The Best and Next in Education. Part 1: What is Genius Hour? Where did the idea come from and how did it start? Why do it? Denise: Genius hour is student-driven, passion-based learning. Very simply, it is a time when learners are asked what they want to learn, and the teacher gets out of their way. I was inspired to have genius hour by a tweet I saw from Angela Maiers in November 2011. After seeing that tweet, I did a Google search for genius hour and Dan Pink’s blog post “The Genius Hour: How 60 minutes a week can electrify your job” came up. That’s all I needed. I knew it was the kind of learning experience I wanted to provide for my students. We’ve been doing it ever since. Last year, Gallit and I started the #geniushour Twitter chat. Our first chat in March 2012 challenged me to start having genius hour each week with my students. Hugh: I first learned of this term after reading Denise Krebs blog and the tweet (referenced above) where she referenced an article titled “Genius Hour” referenced on Daniel Pink’s Blog. Genius Hour is an idea that gave employees in a work place a scheduled autonomous hour each week to think, learn, and explore on how to make themselves and their work environment better, more creative, and more exciting to be a part of. From the blog entry I was immediately struck by how simple the idea is. If you give people time for creativity, discovery, learning, and a say in the culture of their environment, you create an opportunity for empowerment and growth of the individual and the organization. I immediately loved the idea and retweeted Denise’s tweet and then began the journey in my classroom. Denise did a lot of initial work connecting the idea to the classroom. I used a lot of her initial samples and questions preparing my students to participate in their first Genius Hour in the later part of 2011 and early January 2012. The joy in my students’ eyes and the eyes of the teachers in my school when they saw my students at work on their initial Genius Hour projects was priceless. Genius Hour as an idea gives autonomous personalized learning time out of every week to students to question, think, learn, and explore the things they loved and were curious about. This was something special that engaged learners like nothing I had seen before. The learning atmosphere felt amazing. I could walk down the hall and ask Gallit a question and return to see them all still on task, questioning, driving their own learning, and having fun being curious. It was an amazing feeling as a teacher to see your students excited about learning. By modelling what a learner thinks about when they are learning I was seeing individualized, personal, and passionate learning taking place before my eyes by a classroom full of 12 and 13 year olds. Joy: I got the idea from Ewan McIntosh at a conference in Michigan, Feb. 2012. I didn’t have a name for it, but he encouraged us to let students pursue their own learning. He was ready to overhaul our schools so student schedules revolved around this type of learning! All I was looking for was an overhaul of the way our ELA department tackled independent reading. I was so tired of doing more work than the students, with quarterly book projects being due the week of grades, and knowing many students didn’t actually read any of the book. So… researching anything of their choice? Sounds like independent reading to me!! The name came that same month, when Gallit and Denise held a #GeniusHour chat on Twitter… I was hooked on the idea that students could pursue their own learning! Gallit: I first learned about Genius Hour on Twitter. Hugh McDonald retweeted Denise Krebs’ blog post about Daniel Pink’s blog post on Genius Hour in the business world and I immediately loved the idea. I knew I had to try it with my students and have been hooked ever since. Genius Hour has become a precious time, loved by all my students. It is a time when they are allowed to develop their own inquiry question about whatever it is that they want to explore. We start by watching some inspirational videos, talking about our passions and our wonders, and then they develop their questions from there. I think it is so important for students to have that time to really focus on their own wonders. It is truly personalized learning and so vital because as one of my students, Morgan, pointed out, “you don’t want to learn your teacher’s passion, you want to learn your own passion”. Genius Hour is amazing. All the kids are excited and student engagement is at its highest. Some students are huddled around a laptop doing research on countries they are interested in, others are creating websites, PowerPoints and slideshows on an area of interest, and some are out in the hallway filming movies. Some aren’t using technology at all, but rather are building and creating things with their hands. But no matter what they are working on, the common thread is that it is something they are passionate about and/or wonder about. Two years later, Genius Hour is a permanent block on my schedule and the movement is spreading! Every month we have new teachers joining our chat (first Thursday of each month) and our Genius Hour Wiki (geniushour.wikispaces.com) has had over 4000 hits these past two weeks alone! 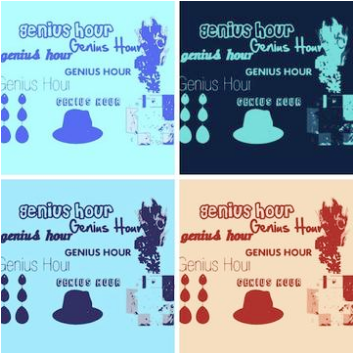 Part 2: How does Genius Hour work in your classes? In Joy’s class, 7th graders have an 80 minute ELA block. We have one block, the first day of the week, dedicated to Genius Hour. Some students just read. Some research. All share, but in different ways (book talks, blog posts, presentations). My dream? For students to read, be inspired, and act on it. (I got this from Erin Olson, after I met her in Boston in July.) Students create a goal every other week, and then grade themselves on it during our one-on-one conferences. If they present what they’ve learned, they fill out a reflection form, but it is not graded. Last year, Gallit gave the students one hour per week and expected them to present about every fourth block, so that they roughly had 3 hours of Genius Hour time before they had to share their learning with the class. Last year, Hugh based individual projects on the premise of 100 minutes of Genius each week. After a couple weeks, Genius Hour students would share with the class via our blogs and in class presentations. This year, we reflected on this practice and decided that we would lift those conditions. Now, students work on their Genius Hour projects every Friday afternoon, and they present when they are ready. For some students that will be after one session and for some it will be after 6. It really depends on what they are learning about and how they plan to present. Genius Hour is personalized learning and so we believe that presentations should take place when students feel ready, not because it is the ‘fourth’ session. We check in with our students regularly and they blog about their progress as well. Denise: I give students two periods a week, about 85 minutes, to work on their genius hour projects. Each Wednesday, students know that they can work on their project of choice. Oftentimes, these projects are long-term, going for 4-6 weeks. Other times, students choose a new project each week. For the most part, students bring their own supplies from home. I believe experience and reflection are key reasons to have genius hour. The experiential learning is engaging and gives students great joy. 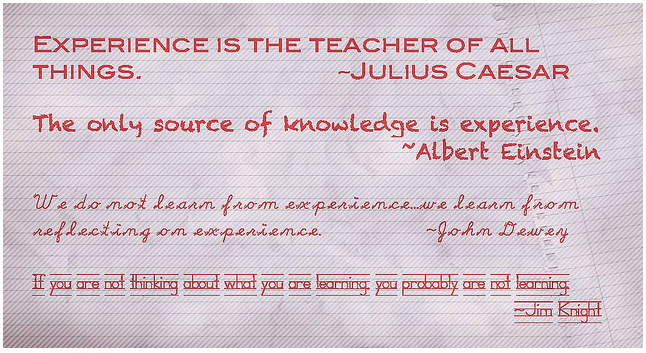 However, I also believe, as many have said, that experience without reflection does not produce real learning. Therefore, as part of genius hour, we do three things. We keep in mind the essential questions that we are trying to answer, we create products of our learning, and we make our learning visible by reflecting in a blog post about what we have learned at least each month. Part 3: Why is this a “next practice” in education…what is the future of Genius Hour and this type of learning? Gallit: I feel passionately about the need for education to become more individualized. I have spent the last two years researching motivation and personalized learning and there is much to be said for the connection between the two. I know that my students love when they are given choice in an assignment or project. They don’t all learn the same and they don’t all have the same interests. That is why Genius Hour is so key; it gives the students the freedom to choose not only the subject matter, but also the method their inquiry project is to use. In a time when answers to fact-based questions are so easily google-able, shouldn’t we be encouraging our students to create, innovate and ask deep, meaningful questions? I don’t need my students to memorize dates and facts, I want them to push the boundaries of their imaginations and become creative doers who fully believe themselves capable of genius, because indeed they all are. Hugh: I feel the importance of personalizing learning for students should be at the forefront of any discussion relating to education, and Genius Hour does that. We want to find ways to engage students as learners and creators of inquiry-driven content. Students want to feel connected to the learning that is happening in their classroom and the standardization of learning across North America does not do that. Students in many classrooms around North America are motivated by letter grades and percentages and NOT LEARNING! Students in our classrooms are like adults in the real world. If you do not engage them in their learning then they will not know how to learn and not want to learn. How else can you explain large chunks of the population dropping out from school? The number one reason the students gave for why they were dropping out was they were bored with school! Yikes!! Inquiry driven models like Genius Hour put the focus on how to question, persevere, and recognize the joy of learning more about their passions. If we give students more opportunity (time) to be creative and connect with what they are learning, then I am sure legislatures around North America and the world will have to adjust their thinking and education policy. Our understanding of school is shifting and we must embrace it and listen to what the world of learners is telling us. “Connect me to my learning, so I can inspire others and myself.” It is not enough anymore to say we are creating a generation of life-long learners if we are not embracing a change in our philosophy in schools to a more personalized, inquiry-driven model that connects a student’s learning to the world. Engage them and teach them how to learn and they will learn for a lifetime. They will be motivated to ask questions and some may find solutions to some of the world’s greatest problems (poverty, cancer, aids, civil wars, the environment, etc…). Dan Pink’s book “Drive” has really pushed my thinking on individual motivation. Simply put, Genius Hour is here to stay because it engages the learner to question and want to learn more. The only question should be is how do we create opportunities for all learners at all levels of schooling to experience the magic of Genius Hour on a regular basis? Another example is in a speech to education leaders in Iowa, Brandon Busteed education director at Gallup Polls, says, “The cost of knowledge is trending toward free.” That reminded me again, as educators we need to get out of the knowledge business and into the learning business. Busteed goes on to say that hope, engagement and well-being account for as much as one-third of the variance in student success. For so long I have been told what to know and taught how to know it, but never once did I really feel in control of my learning. I felt like the knowledge went into my brain, stayed there until after exams, and then was thrown away like a smooth stone into a lake, out of my reach forever. But when you are passionate about something and can learn it the way that YOUR brain understands it, it seems the knowledge takes root. In this age where knowledge is ubiquitous, and no longer belongs to the teacher to dispense during lesson plans, school needs to change. We need to inspire students to become lifelong learners. Genius hour can do that. Part 4: How can we all get involved? Joy: When I realized my students COULD and ARE owning their own learning outside of school, that’s when I realized I could give them the time inside of school. This would make school a more educational place for them, where they could see that they are valued as contributors to our learning. To be taught how to learn independently – that is the hook to creating life-long learners. Denise: Genius hour is not a program. I believe it comes from a student-centered educational philosophy. When I became a connected educator, lifelong learner, and one who makes my own learning visible, that’s when I wanted the same for my students. That’s when I began actively teaching students creativity and the skill of learning. That’s when I started giving them time for genius hour. To get involved, you just need to give up the reins of your classroom for a portion of the day or week. The rewards will bring hope, engagement and well-being to you and your students. You will not be sorry. Gallit: As Denise stated above, Genius Hour is not a program. It is more like a movement in education…a philosophy…a belief that students should have more choice in their learning and more opportunities to be creative! Anyone can do Genius Hour with their class! All you have to do is set aside a little time (one day a month, one hour a week, whatever works for you) when you step aside and allow the students to create their own learning experiences and inquiry projects. Before starting, it is a good idea to scaffold by talking about your passions, what you wonder about and creativity. Some ideas on how to introduce Genius Hour can be found on my blog at http://www.gallitzvi.com/2/post/2012/10/introducing-genius-hour.html and on the Genius Hour wiki at geniushour.wikispaces.com. You can also check out the #GeniusHour hashtag on Twitter and join in the conversation! There are so many fantastic educators on Twitter who would be more than glad to help out! One of my students, Hunter, has a wish that “someday every teacher could let their children do [Genius Hour]”. Me too, Hunter, me too. Hugh: I agree with my colleagues above. Genius Hour is a shift in education philosophy from teacher centered learning to student centered learning. It puts students in charge of creating questions in their learning. Genius Hour gives them opportunity to learn from their discoveries that work and don’t work and be okay with that, as long as they are prepared to ask more questions and be persistent in their learning. The world needs generations of thinkers that are creating questions and working hard to answer them. How can you get involved? You can be brave and join the conversation on the Genius Hour hashtag on twitter (#geniushour). #geniushour is also home to a powerful and engaging chat hosted by Denise and Gallit that takes place the first Thursday of each month at 6pm PST. You can also access the Genius Hour Wiki geniushour.wikispaces.com. It is filled with a lot of resources to guide you in establishing Genius Hour in your classroom. There are a lot of amazing educators and risk-takers on there sharing their resources and engaging you in conversation about the personalized learning and inquiry taking place in their classes daily. Join the conversation, learn, and share your experiences by blogging and tweeting about your experiences and the experiences of your students. We all can learn from each other. It reminds me of this blog post I wrote on Genius Hour “Sharing Genius Hour – Simple to You and Amazing to Others”. You never know what will spark someone into exploring the genius within themselves. It is what we do with our students. Shouldn’t we be looking to do this for other educators too? We are all learners, and we should all have the gift of time to explore our passions in creative ways. We are all here to help guide students and each other in the journey of learning. Joy Kirr (@joykirr) teaches seventh grade English language arts in Arlington Heights, Illinois, and blogs at My Own Genius Hour. Denise Krebs (@mrsdkrebs) teaches grades 7 and 8 at a small Catholic school in Granville, Iowa, and blogs at Dare to Care. Hugh McDonald (@hughtheteacher) and Gallit Zvi (@gallit_z) team teach grades 6/7 in Surrey, British Columbia. Hugh blogs at Today is a Great Day for Learning. Gallit blogs at Integrating Technology and Genius Hour: My Journey as a Teacher and Learner. The Genius Hour Guidebook – Coming Soon!